There is a lot of interest building within the Cruiser fleets in the harbour about next week’s Ballycotton Race, Saturday 22nd July. Traditionally an annual trophy race, it has in recent times been left out of the sailing calendar due to a lack of interest. The general resurgence of Coastal racing has renewed the interest in races like the Ballycotton Race. A simple formula: Start at Grassy Walk (FG 11.25hrs) and race to Ballycotton, go ashore and enjoy the seaside village and return on the change of the tide. Some may even stay over and come back on the Sunday. Former member Dan Walsh and family have very kindly provided a trophy for the Ballycotton Race on Saturday 22nd July. Dan is a former member of club and now living the US, but is still very involved in sailing. Dan in his youth used to race a very fast and well varnished Cadet dinghy (John Cudmore had it before Dan). Dan’s parents, Paddy and Peg Walsh, were very involved in the club. Paddy was Admiral in 1988 and 1989. 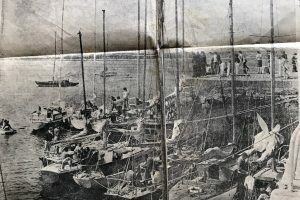 Ballycotton pier from the race in 1974 (photo from The Cork Examiner). 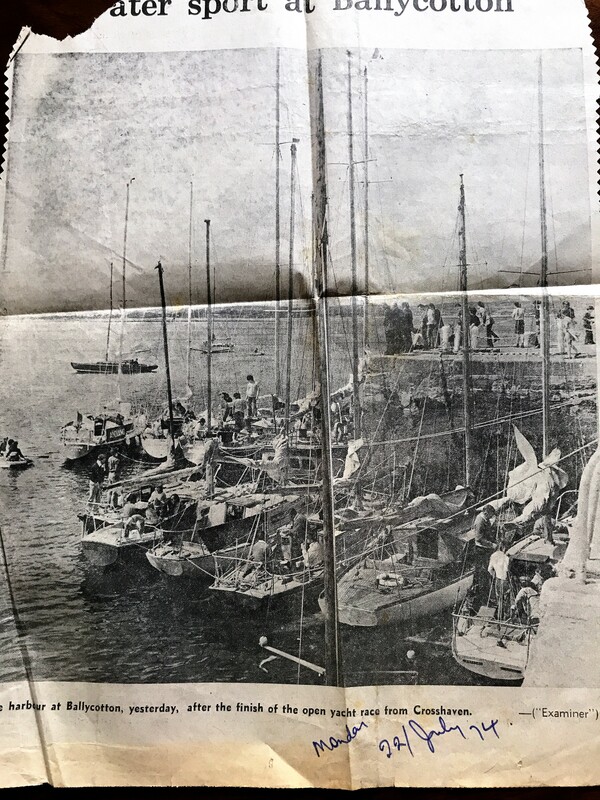 See attached photo of the pier from the race in 1974 (from The Cork Examiner). Note: There is a Breakwater, Pontoon and visitor moorings available there now. Enjoy this old style ‘Yacht Race’.